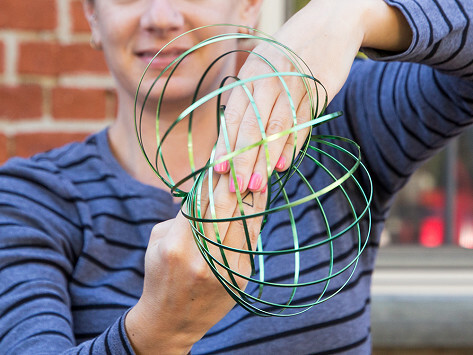 Mozi is a slinky-meets-fidget toy for your arm. Glide it across from one arm to another or pass from your arm to a friend’s. Its simplicity is mesmerizing and addictive. Dimensions: 5" diameter x 0.5"
Bought as additional birthday present. This was a stocking gift for my granddaughter, and she loved it. She played with it throughout the party. She's 15 and is in constant motion - this is a fun addition. 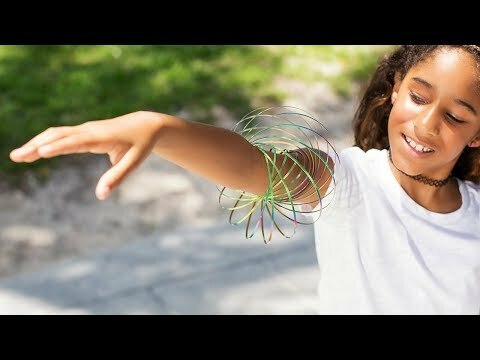 This is a slinky-meets-fidget toy for your arm. It’s one of those simple, yet addictive toys for people of any age. Mozi slips over your arms and spins in mesmerizing patterns across it. Roll it from arm to arm or friend to friend. Then, once it’s made its rounds, just fold it flat by turning it counterclockwise between your hands. Its smooth, caterpillar-like movement works best on bare skin. Everyone here at The Grommet got a kick out of playing with Mozi and we’re keeping a few around for fun.